This is more of a first impression type of thing than a full on review. I bought this teeny-tiny luxe looking travel sized tube (I love that even the minis have gorgeous packaging!) 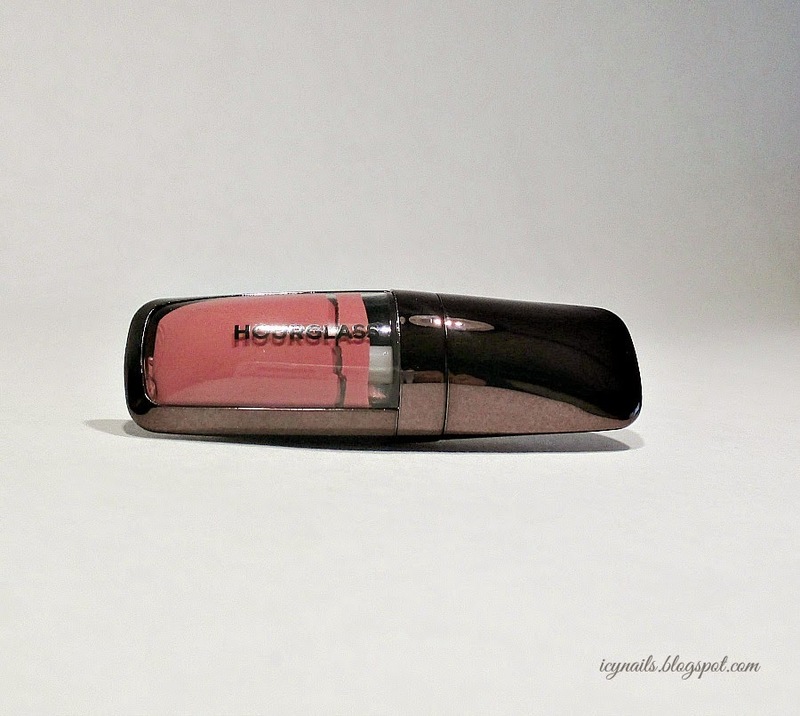 of the Hourglass Indestructible Matte Opaque Rouge Liquid Lipstick when I placed a recent Sephora order. I have read a lot of reviews and I needed to try it so I bought the mini. It was only ten dollars and I could choose between Icon, their signature red and Canvas, a soft, rose beige. 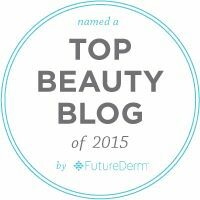 Inside the tube is a velvety, extremely flexible elongated applicator. It can apply a very precise line and also fill in the lips quickly and smoothly. Once I got the feel for it, I really liked it. 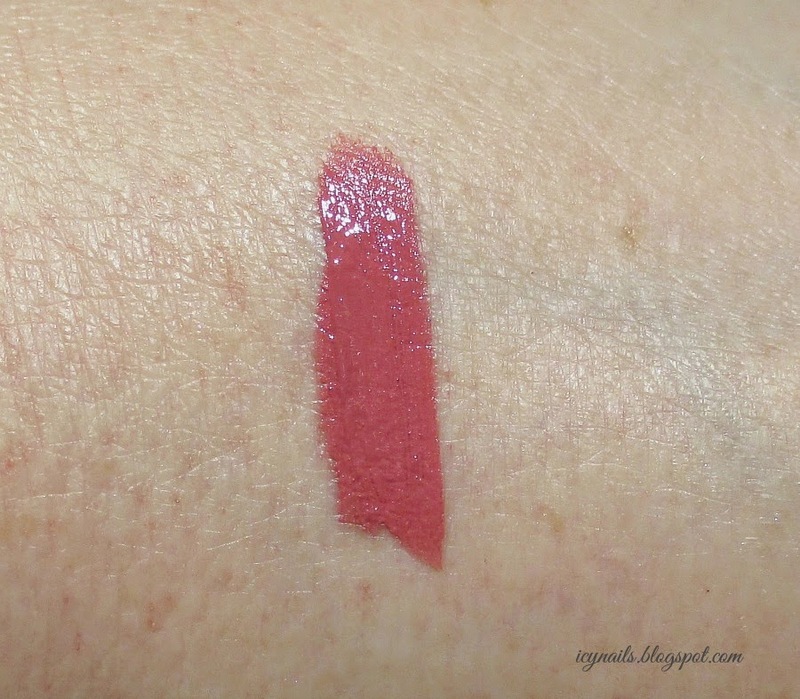 A quick swatch of the Hourglass Indestructible Matte Opaque Rouge Liquid Lipstick. It is a thick, creamy smooth, densely pigmented formula that starts out glossy and dries down matte. While it dries quickly enough that you aren't sitting around all day, waiting for it to set, there is plenty of time to work with it before it does. On my lips you can see the colour and finish better than the swatch. I applied this thicker, at first and it was just too heavy and sticky. I didn't like how it looked or felt so I blotted off the excess and used my finger to smooth and even it out and once it set, I liked it much better. 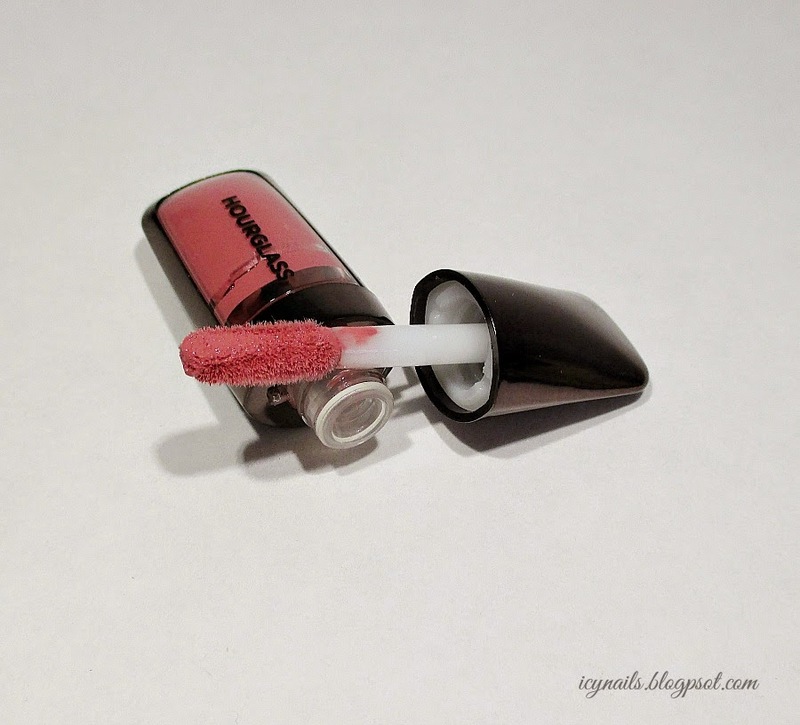 The finish is matte and velvety soft, like a young rose petal. It remains flexible and fairly comfortable. There is a tiny bit of tack when I press my lips together but it doesn't stick, grab or pull apart. It is definitely different. The texture and wear are something to which I am not at all accustomed but it is certainly not unpleasant. I love that this lipstick, once in place doesn't move. It barely transfers, it doesn't run up into the little lines around my lips, I don't have to worry about it. Removal is... A bit of a bear. I used a makeup remover wipe to take off the bulk of the colour then I used some balm and a Q-Tip to finish cleaning off my lips to ready them for another lippie. I really like Canvas. I think that it works with my skin tone. 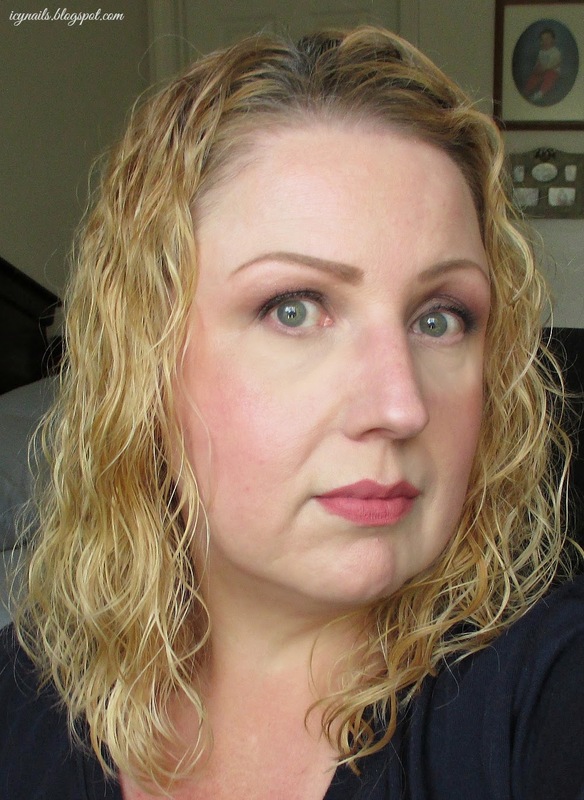 The formula is densely pigmented enough to stand up against my naturally red lips, even when applied in a very thin layer. I love that it doesn't move or crawl all over my face. I need to wear it more to determine if I am going to want a full size tube. We'll see. So far, I like but I am happy that I am working with a mini, at this point. I'm still not sure if I want to commit to a full size. 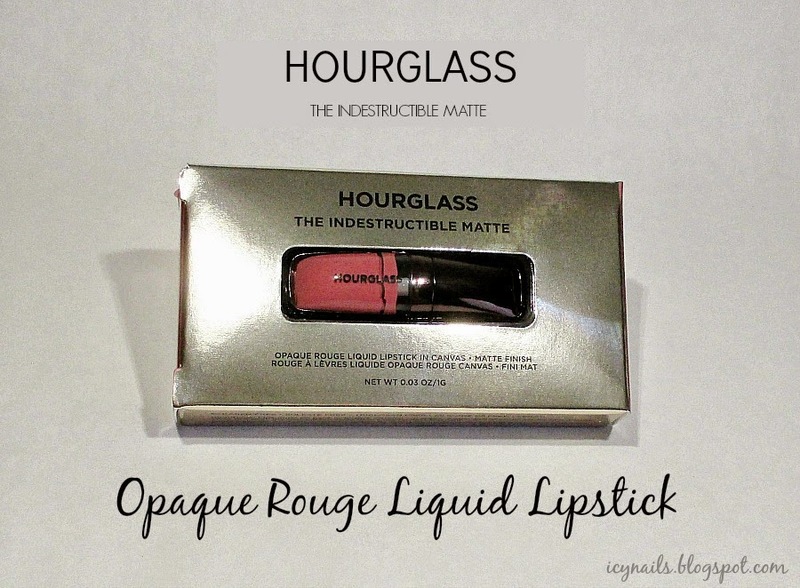 Have you tried the Hourglass Indestructible Matte Opaque Rouge Liquid Lipstick? What do you think of it? If you would like to grab one to try, they have a full sized tube available in nine beautiful shades for $28.00 and the mini travel sized tube available in two shades for $10.00. I am seriously tempted to pick up the mini in Icon, next time. That red... It's calling my name. The color is pretty. It suits you. The shade is perfect for you. I almost bought this mini recently, but I read some negative reviews so I didn't go for it. But I can't remember what the complaint was...probably something to do with being not suited to dry lips like mine, maybe? I love the Canvas shade on you, and I think it would suit me too. So back on my list it goes! Love this on you! Simply mentioning the word matte makes my lips shrivel, so that's probably why I haven't investigated these. If I ever get brave though, $10 for a mini doesn't sound half bad. Looks beautiful on you--I think I look terrible in matte lipsticks but this looks good enough to try--esp. the mini for $10! omg this color is stunning... and only $10? Must have! 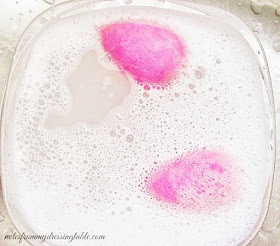 I love how soft, natural this looks - it def matches your lip/ skin undertones. That is just about the perfect shade! this is such a gorgeous shade. It's great to know they have more mini shades, I haven't found any besides Icon. I like this shade on you! It really suits your complexion. I like that it's matte and how natural it looks. I've been tending to grab more natural looking shades lately! This is so pretty! I have icon and love it! I have this color and I think it's a nice neutral. I love their blushes and highlighters, but haven't tried the lip products yet! This is a very pretty color; it looks great on you! I've never really tried matte lipsticks. I'm a smoosher (meaning I constantly smoosh my lips together), so I'm unsure how a matte formula would stand up to that. This shade is beauteous! I love their glosses so I'll need to test these out. I am betting life that I would love this! Thanks, so do I. It's very neutral and wearable. I'm betting that you would, too. It would look fab on you. I love the Ambient blush I have. Want ALL of them! And the shadow palette coming out! I like this one. I'd like more shades. I want Icon, I'm going to test drive the mini before investing in the full size, tho. I LOVE that Hourglass makes the tiny ones! They need to do all of the shades in teeny tiny sizes! I'd buy all of them! Thank you. I really like this.